It has been months since I sat down in my craft room for more than a moment. Yesterday I had the afternoon and after tidying things up, I made this card. 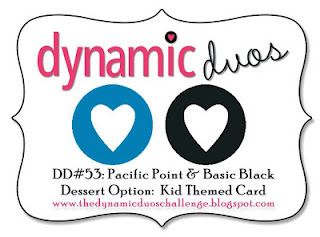 It was inspired by the second fabulous card in THIS post by my dear friend Jenny, and the color scheme in this week's Dynamic Duos challenge. Stamps~Paper Smooches I Heart Art and Shadows. Ink~ Memento Tuxedo Black, VersaFine Onyx Black, SU Pacific Point. Hooray for crafting time, right? Tidying, not so much. This is such a fun and happy card. I just love that big blue splotch. Love your arty card.. perfect stamps to use for the colours!! Great card! I like the way you did it! Your card brings a smile to my face! Thanks so much for joining us at Dynamic Duos! What a clever card! I like Jenny's card too. She may have inspired you, but both cards are completely unique and fun. So happy you had a chance to play! Oh how cute! 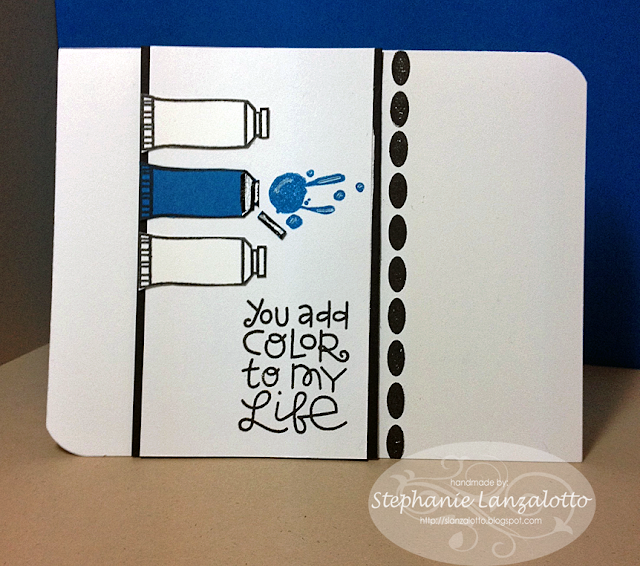 I love that blue splotch of paint - such a clean and fun card :) Thanks for sharing with us at Dynamic Duos this week! I saw this card and loved this card and didn't realize right away that it was your first post in a VERY long time! Welcome back - I look forward to many more!